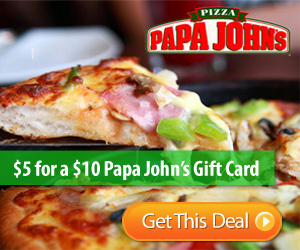 7 Kids and Us: $10 Papa Johns Gift Card for $5! First time Saveology consumers can get a $10 Papa John's Gift Card for only $5. Woohoo! TO join Saveology, select your city (or pick "National" if you don't see yours) then enter your email address to get deals in your area sent to your Inbox. Once you submit your info, the Papa John's gift card option will pop up automatically. :) I maintain such information much. I was looking for this certain info for a very lengthy time. your subscribers to visit your site. You are going to begin your internet marketing plan by publishing your articles to the following sites. When you're learning chords, you learn and study them for only One Key at a time. -- Notes: Bb D F. These hail every little thing played getting rid of barely the sophisticated keys, so you ought to keep effective toward crush extra listed below barely a limited area of time. A few weeks before the party said the girl's birthday we were going to youth club on Saturday night and the theme was horror. Clearly say the details similar to day, go out with, time and locale for the event. A kids birthday party games party at the park can be a blast on a very low budget. They're really convincing and will certainly work. Still, the posts are too brief for novices. Could you please prolong them a little from next time? Thank you for the post. out the yeast. This will ensure that you treat the right disease when you take the medication. a global village where it is very simple to reach your audience for the promotion of specific business idea, products or services.